SOF News Update 20180924 – SBS getting SDV MK XI SWCSs, Russia’s Black Shadow DPVs, paper – Will to Fight, political commissars redux, M4 glitch fixed, Mk13 sniper rifle for USMC, Turkish combat divers, and more. SBS’s SWCSs. The United Kingdom’s Special Boat Service will be receiving delivery of three SEAL Delivery Vehicles (SDV) MK XI Shallow Water Combat Submersibles (SWCS). At $30 million a piece it should offer some robust capabilities. Read more in “UK Special Forces to receive three mini-submarine from USA”, Defence Blog, September 21, 2018. Turkish Combat Divers. 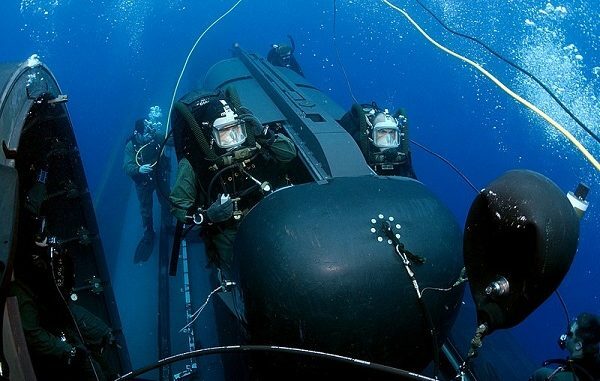 Read up on the training and organization (with pictures) of the Turkish Naval Special Forces. (Daily Mail, Sep 23, 2018). More CV-22s? The US Air Force vision for the future could mean an increase to 27 special operations squadrons. (Defense Daily, Sep 21, 2018). Russia’s Black Shadow DPVs. Russian combat swimmers have been using German-made diving scooters for military training. They were recently used in a military exercise in the East Mediterranean. “Diving Scooter Displayed by Russian Special Forces”, IHLS, September 21, 2018. AFSOC Briefs up Hollywood. For three days the Air Force Special Operations Command hosted members of the entertainment industry. Read more in “Hollywood comes to Hurlburt”, NWF Daily News, Sep 21, 2018). Navy SEAL Foundation. An informative article about the good work done on behalf of the SEAL community. (Coronado Eagle & Journal, Sep 21, 2018). JAG for SEALs in Iraq Running for Congress. Ron DeSantis is a Republican running for Governor in Florida. In 2007 he served as a senior legal advisor to a SEAL who commanded Special Operations Task Force – West in Falluja, Iraq. (Miami Herald, Sep 21, 2018). Political Commissars Redux. A structure for indoctrinating military personnel has been introduced to the Russian military. A decree has established the ‘Main Military and Political Directorate’ (GVPU) of the Armed Forces. Read “Putin’s Ideology Being Established in the Armed Forces”, Eurasia Daily Monitor, September 20, 2018. Vostok 2018. Some observers cite the military exercise taking place in central and eastern Russia as the largest since the height of the Cold War. What is interesting is the participation of China. (RAND Blog, Sep 11, 2018). Russia’s Big Guns. The Russian military is bringing back the old but heavy artillery of the Cold War era. Some analysts wonder why. (The National Interest, Sep 20, 2018). Female UK Vets Feel Unsupported. Female members of the UK’s military are not getting the level of support that male members receive once they depart from the military. (The Military Times, Sep 19, 2018). CT Strategy Needed. Terrorism activity is picking up in Southeast Asia. This is due in part to the return of ISIS combatants where that organization has lost significant territory in Syria and Iraq. There is a risk of partnerships between ISIS and regional terrorist organizations. Read more in “ASEAN needs to unify its counter-terrorism strategy”, East Asian Forum, September 22, 2018. China Cautiously Advances. China is slowly taking more interest in the affairs of Afghanistan for a number of reasons. If stability can be established then China is positioned to take advantage of its natural resources. Afghanistan can also serve as a market and transit point for its ‘Belt and Road’ project. There is also the vexing problem of Uighur jihadists that could – if Afghanistan security deteriorates further – operate along the Chinese-Afghan border area complicating the security situation in the Xinjiang region. Read more in “China’s Surreptitious Advance in Afghanistan”, The Diplomat, September 22, 2018. Unsustainable Casualties. A recent New York Times article reports that Afghan and U.S. officials have decided to keep ANDSF death tolls secret due to the significant rise in losses. In 2016 there were roughly 22 KIAs a day, so in 2017 RS and the Afghan govt decided to hide the deadly toll from the public. It is worse now – Some weeks the daily toll is almost 60 soldiers and policemen. Increased Air Strikes Cause Taliban Tactics Shift. The Taliban are not gathering in groups or in large convoys as much as they used to. The increased air attacks by the U.S. and Afghan Air Force has prompted some tactical shifts. (The Epoch Times, Sep 23, 2018). Turkey and Syria. Ankara had some success in recent campaigns to unit a number of Free Syrian Army rebel groups to fight both ISIS and Kurdish forces along Turkey’s border. While this retention of territory south of the border was a military victory there has been a breakdown in security and growing social problems – posing a threat to the strategic interests of Turkey. (Chatman House, Sep 2018). Che Guevara’s Bolivian Misadventure. Christopher Rodriguez writes about Che’s failure to establish a revolution in Bolivia in the late 1960s. Something about an SF team . . . it seems. Read “The Bolivian Insurgency of 1966-1967: Che Guevara’s Final Failure”, Small Arms Journal, September 23, 2018. Corruption Again a Problem. The British ambassador to Baghdad is warning that the biggest threat to the future stability of Iraq is corruption. (Evening Standard, Sep 21, 2018). M4 / M4A1 Glitch Fixed. The Army has investigated how some of its rifles have been misfiring. (Military.com, Sep 21, 2018). Mk13 Sniper Rifle for USMC. The Mk13 Mod 7 sniper rifle is being issued to the 1st Marine Expeditionary Force – infantry, reconnaissance, and scout sniper schoolhouses. “The Corps has already started fielding the new Mk13 sniper rifle”, Marine Corps Times, September 20, 2018. Army Recruitment Down. While the Navy, Air Force, and Marine Corps have all me their recruiting goals for 2018; the Army has not. The shortage is blamed in part on a very strong US economy and increased competition from private sector employers who can pay more. In addition, only 30 percent of the 17 to 24-year-olds meet the physical, mental, and moral requirements in the military and only 1 in 8 are interested in serving. Read “Army Misses 2018 Recruiting Goal”, Voice of America, September 22, 2018. Will to Fight. A slew of co-authors have penned a 275-page report that explains will to fight at the unit level and attempts to develop a model designed to support assessment of partner forces and analysis of adversary forces. According to the paper the will to fight may be the single most important factor in war; however, this fundamental concept is poorly integrated into practice. It could be especially helpful to military advisors working with partner military units (p. 198). The paper presents a number of key findings and offers some recommendations. One interesting tidbit is a suggested revision of the Special Operations Debrief and Retrieval System (SODARS) that provides an assessment f a partner military force’s ‘will to fight’ (p. 47). Will to Fight: Analyzing, Modeling, and Simulating the Will to Fight of Military Units, RAND Corporation, September 2018. Security Assistance. A new report provides food for thought about security assistance. It has two articles worth reading – “A New Approach to Security Force Assistance” and “The Value of Regionally Aligned Forces in Army Security Cooperation”. RAND Arroyo Center Annual Report 2017-2018, RAND Corporation, September 2018. Podcast – Vietnam’s Indelible Legacy. War on the Rocks, September 21, 2018, 48 minutes. Commentators talk about how the Vietnam War changed national security policymaking. Bringing the MIA Home. The Defense Prisoners of War / Missing in Action Accounting Agency continues to attempt to account for the MIA from the nation’s wars. Bringing Them Home, U.S. Army, Sep 21, 2018. This 8 minute long video explains the mission of the Defense Prisoners of War / Missing in Action Accounting Office. The Deputy Director of Outreach and Communications for DPAA explains his role in this 5 min long video. U.S. Army, Sep 22, 2018. Legion of Brothers. A film about Special Forces going into battle in Afghanistan after the 9/11 attacks in the fall of 2001 has been nominated for an Emmy. (ASU Now, Sep 21, 2018). Watch the trailer. Order on Amazon.com. Highlights of the Army vs Oklahoma Football Game. An exciting finish that went into overtime. Okies win but Army looks good and gets a standing ovation from the Oklahoma fans. 4-min highlight film published by Big 12 Conference, September 22, 2018. Book Review – The Future of War: A History. Lawrence Freedman, a professor of War Studies at King’s College London, provides a book that reviews the history of predicting how warfare will develop. Wavell Room (UK), August, 19, 2018. Photo: SEALs prepare to launch SEAL Delivery Vehicle (SDV) from the back of the USS Philadelphia. The SDVs are used to carry Navy SEALs from a submerged submarine to enemy targets while staying underwater and undetected. U.S. Navy photo by Chief Photographer’s Mate Andrew McKaskle, May 5, 2005.